Designed by URW++ in 2005. Published by Profonts. Ballerina Pro sounds like music, ballet, elegance and classic quality. That's exactly how Ballerina Pro carries the message to the reader. 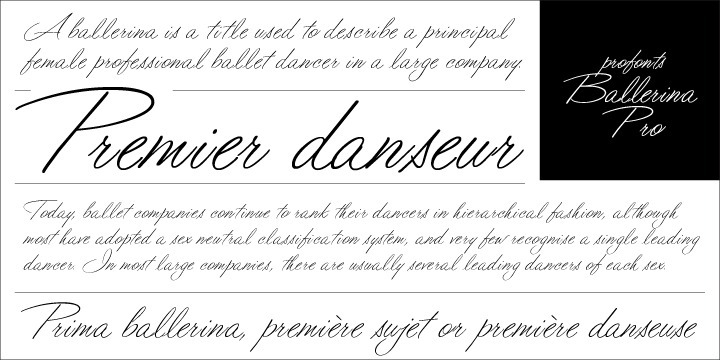 Ballerina Pro is a more of a formal script, light-weighted and very beautiful.? ?Ballerina Pro comes with 600 characters covering the complete Latin glyph set for West and East including Baltic and Turkish. Additionally, there is a large selection of stylistic alternates and ligatures to make this beautiful script design a perfect font for OTF-savvy applications.? ?Ballerina Pro is a very distinguished, elegant and versatile script font well-suited for anything in the area of ballet, classical music, art, ballet etc. Also, it is good for certificates, reports, documents and alike. Ballerina supports up to 74 different languages such as Spanish, English, Portuguese, German, French, Turkish, Italian, Polish, Kurdish (Latin), Romanian, Dutch, Hungarian, Serbian (Latin), Czech, Kazakh (Latin), Swedish, Belarusian (Latin), Croatian, Finnish, Slovak, Lithuanian, Latvian, Slovenian, Irish, Estonian, Basque, Luxembourgian, and Icelandic in Latin and other scripts.